After crunching the numbers, I finally pulled the trigger and bought a Toyota Prius this week. For the past two years, I've been driving a 4-cylinder 2006 Ford Fusion and have been fairly happy with it. Just to be clear, there was really nothing wrong my Fusion. However, I commute 30+ miles each way from my house to work and back each day. I was achieving around 26 miles per gallon with the Fusion. Highway mileage was actually closer to 29/30 mpg, but the actual average came in lower. For the most part, I drive the posted speed limits (seriously). This means that my commute on the highway is mostly 65 miles per hour. I noticed a fairly significant difference in my mpg if I drove any faster ... i.e., at 70 (maybe a bit more) mph, my mpg would drop from 29/30 to around 24/25. I think the optimum speed for maximum mpg was in the neighborhood of 55 mph on my Fusion, which would bump my mpg to around 33/34. Not bad, but I do a lot of stop-and-go driving too in the city which, as most of us know, absolutely crush the overall mpg. As for the numbers, when I looked over my credit card charges for the past several months, I found that I was spending anywhere between $300 to $400 per month on gas! To be fair, that's not just driving to work and back, but still ... those are hard-earned, real dollars going down the tank and out of the exhaust. Granted, it's much better than it would have been if I still had my old Ford Expedition. And yes, I realize that the price at the pump is over $1.00 less per gallon today than it was only a month or so ago, but who truly believes prices will continue falling or even remain flat? So, I found out that Ruda Toyota in Monroe, WI had a few "slightly used" hybrids on their lot and decided to take a look. 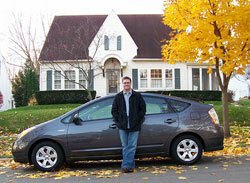 After test driving a Prius, I was actually quite surprised at how much I liked it. The Prius has much more room inside than you might realize. In fact, it seems like the cabin area has more space than the Ford Fusion. The hatch/trunk area is a little smaller than the Ford Fusion, but I really didn't keep much back there anyway other than my baseball glove, some baseballs, a bat and some lawn chairs. If needed, the back seats fold flat which open the entire back of the vehicle giving plenty of room for transporting "stuff." However, with the whole family loaded up, I think we would have to pack carefully for any long trips/vacations. The Prius rides very nice too. It takes a little getting used to though. For example, I push a button on the dash to start the vehicle and the only way to confirm it's actually "running" is the "Ready" light that appears on the dash. Also, while at a stop light, if the gas engine was running, you might feel/hear it just turn off. Now that's a weird feeling! The pre-hybrid driver in me wants to look for a key to twist and step on the gas pedal, but no fear ... the car is "Ready." When the light turns green, I simply step on the pedal and drive away. I've been told by another Prius driver that driving in the snow is a little different too, so I'll be sure to blog about my experiences as they arise ... which by most accounts could be very soon here in Northern Illinois. Now when I bought the Prius, I thought I'd be completely satisfied with an average of 40 miles per gallon. I had been hearing people say they get 50 to as much as 60 miles per gallon, but we know how people like to exaggerate, eh? Needless to say, I didn't believe the numbers being thrown around and I needed to see it for myself. As of my trip to work this morning, my average was 47.8 miles per gallon over the preceding 150 miles. That's over 20 miles per gallon better than I was getting with a 4-cylinder Ford Fusion! Actually, it's almost twice the amount I was used too. Before this morning's trip, I was over 48 miles per gallon, but it was a pretty windy and rainy day which seemed to negatively impact my mpg. Regardless of the fuel-efficiency, I'm officially a fan of the Toyota Prius. Yes, it was the fuel-efficiency that initially drew me to the Prius, but it was the overall quality of the vehicle that sold me on it. To be sure, nearly cutting my monthly fuel bill in half doesn't hurt either. My wife and I both own Prius (Priusi?). We LOVE them. I had a jeep before and after 12 years it was time for a new car, same situation for my wife so the timing was perfect. Completely coincidentally her parents bought a Prius at about the same time too. Something bust have been in the air in 2005. Since then we have had no issues aside from forgetting to turn one of them off for about a day. Snow is no problem though you may want all weather tires for it if you drive a lot. The best feature for me that I didn't expect is the keyless operation. I get to the door and it senses my wireless key and just unlocks, same for turning it on. I can't imagine going back to actual keys. FYI, you can turn off the beeps for seat belts and reverse. No idea why it beeps in reverse as it only beeps in the car, no warning to others (which may be handy as its so quiet). Yeah, forgetting to turn off your car for about a day _could_ be an issue. Thanks for the tip about the snow. I'm not lucky enough to have the "smart key" so I have to stick my key fob into the dash before I push the start button. Thanks also for the tip to turn off the reverse beeping ... although my son seems to enjoy it. I have visited a lot of articles of this website and i felt this website have unique content to learn SQL and other development related languages. However, I try to get reviews of http://best-essay-writing.services/essaypro-com-re... and yes this is perfect platform to share this site. Those who come to read your article will find lots of helpful and informative tips https://computerscienceassignmentshelp.xyz/php-cak... Really i appreciate the effort you made to share the knowledge. This is really a great stuff for sharing. Keep it up . Thanks for sharing. Science Channel’s are giving a complete knowledge to its viewers about every thing students write done dissertation on this subjects and show its importance. https://www.engineeringassignment.xyz/civil-engine... I personally like your post, you have shared good article. It will help me in great deal. I really adore your commitment to offer your readers such valuable information. Looking forward to read again. Thanks a lot for sharing this best post.. i hope keep more sharing.. Very nice post I really enjoyed it...You can also visit my website for. Your site has a lot of useful information for myself I visit regularly hope to have more quality items. Get Coursework writing help from our dedicated writers who are always ready to support students in their academics at affordable price. Really great website simple looking and unique content thanks for the opportunity. The professional assignment experts at StudentsAssignmentHelp.com are relevant in offering great UAE Assignment Help services. Our UAE writers always make sure to deliver high-quality assignment content that will help you impress your professor. It is important to know about the financial market, our stock market training in Hyderabad will train you about the financial subject. Your blog inspires me every time when I read it. I love reading blogs. I don't excite always by reading blog posts. But in your blog I find something that implies in blogging.